From the driveway mechanic to the backyard gardener, many diverse people are "doing it themselves" by building or repairing the stuff of their daily lives without the aid of experts. 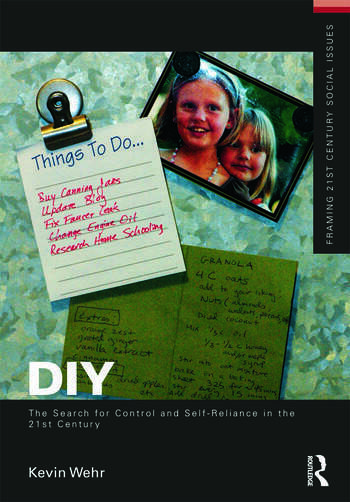 Do It Yourself uses Habermas’s colonization of the lifeworld as a frame and mobilizes Marx’s concepts of alienation and mystification to examine how social behaviors can be a conscious reply to a complex and fast-moving world, a nostalgia for simpler times past, or a just an economic impulse. Each main chapter is anchored by an extended empirical example: back-to-the-land, home-schooling, and self-government. Kevin Wehr is Associate Professor of Sociology at the California State University, Sacramento, where he specializes in environmental, political, and cultural sociology. He received his Ph.D. in 2002 and his M.S. in 1998 from the University of Wisconsin, Madison, and his B.A. in 1994 from the University of California Santa Cruz. His other works include America’s Fight over Water: The Environmental and Political Effects of Large-Scale Water Systems and Hermes on Two Wheels: The Sociology of Bicycle Messengers.